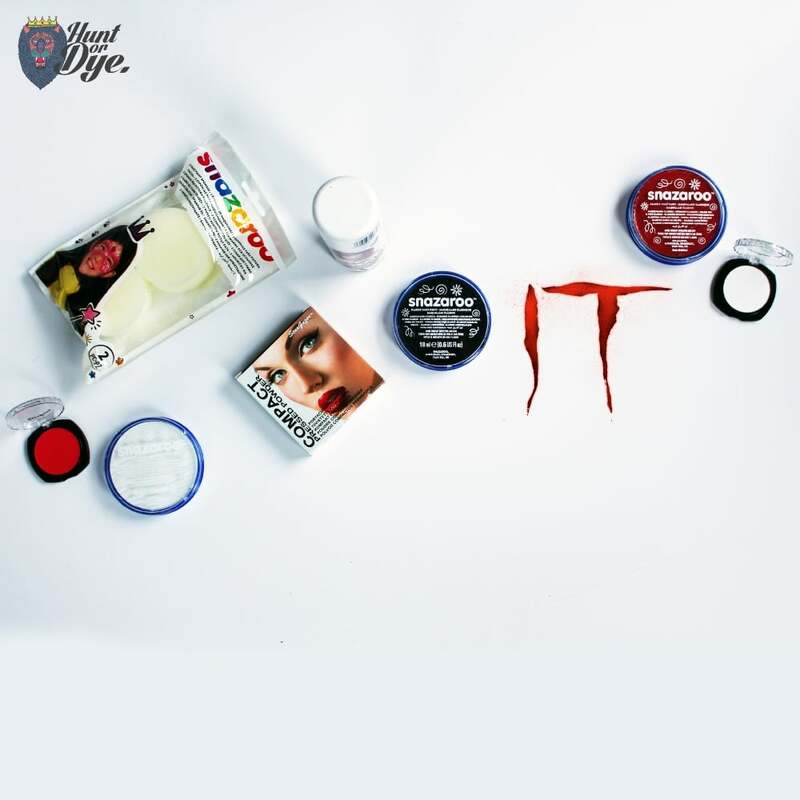 Be the ideal scary Clown with 'The IT Clown Makeup Set' which will help your costume stand out and will show everyone no more Mr Nice Clown. Being bad is what it is all about. White Eye Shadow: Apply on the face & eyes to make the face stand out and help bring 'The IT Clown' back to life. Compact Pressed Powder - White: Apply on the face to help give the IT Clown, more of a realistic look. Face and Body Paint - Black: Use to help create scary eyes, lines, different pattern and many more designs. Face and Body Paint - White: To help give you a complete white face to match The IT Clown, to help it last longer. Face and Body Paint - Red: Use to help create a bright red nose, just like The IT Clown. Rebellious UV Hair Spray - Red: Helps give you more of a realistic effect to your costume, with the Rebellious UV Red Hair Spray. Gives you red hair to help you look more like the IT Clown. WHITE EYE SHADOW: SMALL PARTS CHOKING HAZARD. DANGEROUS IF SWALLOWED. DO NOT USE! DO NOT APPLY TO DAMAGED INFLAMED OR SENSITIVE SKIN. FACE PAINT - BLACK: AVOID CONTACT WITH EYES AND LIPS. FACE PAINT - RED: AVOID CONTACT WITH EYES AND LIPS. REBELLIOUS UV HAIRSPRAY - White: EXTREMELY FLAMMABLE - PRESSURISED CONTAINER. KEEP OUT OF REACH OF CHILDREN. KEEP AWAY FROM HEAT, HOT SURFACES,SPARKS,OPEN FLAMES AND OTHER IGNITION SOURCE. DO NOT EXPOSE TO TEMPERATURE EXCEDDING 50 DEGREES OR 122*F. DO NOT BREATH THE SPRAY IN.